James Mcclymont recalls the pain and social stigma. 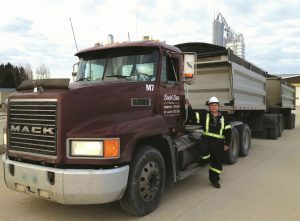 James Mcclymont was a 25-year-old truck driver when he mysteriously broke out in a blistery rash on his elbows, knees, crotch and the side of his face. He says the itching was so bad he can still remember how it felt decades later. Mcclymont, 56, who lives in a rural community in Manitoba, Canada, was originally diagnosed with scabies, but a second doctor recognized what the rash really was. A skin biopsy taken from Mcclymont’s thigh confirmed that it was dermatitis herpetiformis, also known as DH. DH is the form of celiac disease that erupts on the skin. This is a chronic autoimmune condition in which the gluten in wheat, barley and rye will trigger a rash that usually occurs on both sides of the body on the elbows, knees, and buttocks, although it can show up in other areas as well. When Mcclymont, a native of Scotland who lived there when he developed DH, talks about the disease it’s hard not to hear the pain in his voice despite his melodic brogue. He describes a devastating time when he struggled to cope with everyday life. Watery blisters developed everywhere his clothing rubbed and even on the bridge of his nose where his glasses sat. He was embarrassed by his appearance and struggled with new relationships. As a young man, he was self-conscious when he went out to nightclubs because he thought the rash was especially visible under the strobe lights. 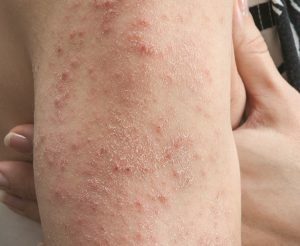 Though his story has a happy ending that includes marriage and control of the rash, it reflects the precise challenges of dermatitis herpetiformis within the larger context of celiac disease. 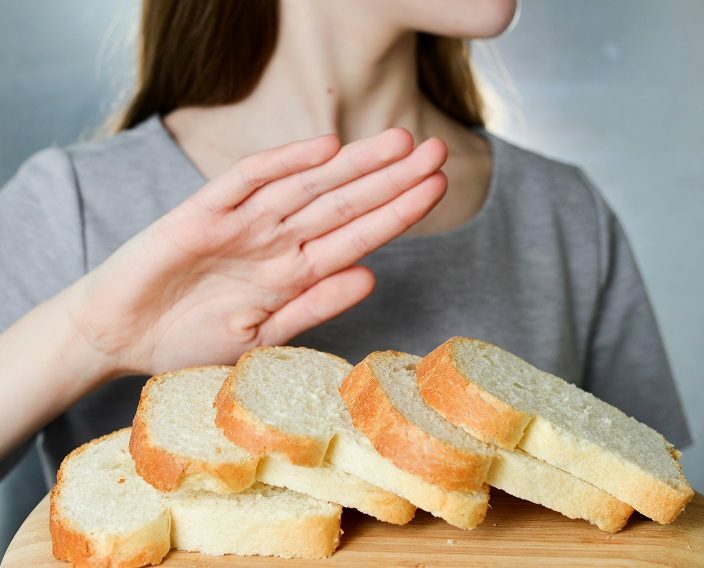 When someone who has dermatitis herpetiformis consumes gluten, his or her immune system launches an attack by producing antibodies. In celiac disease, the immune system attack damages the absorbing lining of the small intestine. In DH, the attack primarily takes place in the skin as antibodies stimulated in the intestine circulate through the bloodstream. Immunoglobulin A (IgA) is deposited in the skin, triggering an immune reaction that results in the formation of the lesions. Dr. Sylvia Hsu: gluten-free diet is essential for DH. Although the effect is seen on the skin, touching gluten-containing foods or lotions, creams and other body products has not been shown to trigger a DH rash. Those who have DH don’t always have classic intestinal damage, but the condition is still considered “full-blown celiac disease,” Fasano says, noting that in 25 percent of DH cases only the skin is affected. The remaining 75 percent have damage to the villi that line the intestine, but this is generally limited and patients may have no obvious gastrointestinal symptoms. DH is diagnosed through the anti-tissue transglutaminase antibody blood test (tTG) and a skin biopsy. When the biopsy is done, a sample is taken from the area next to a skin lesion to determine if IgA occurs in deposits that appear in a granular pattern. When DH is diagnosed this way, the intestinal biopsy used to diagnose celiac disease is not needed. 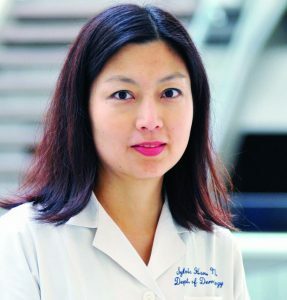 Dr. Sylvia Hsu, a professor of dermatology at Baylor College of Medicine in Houston, says it’s critical for dermatologists, who treat skin conditions, to follow all the steps to confirm the diagnosed of DH. It’s important that the biopsy be taken from the correct spot. “If you don’t, you may miss the diagnosis,” says Hsu, who has the condition. 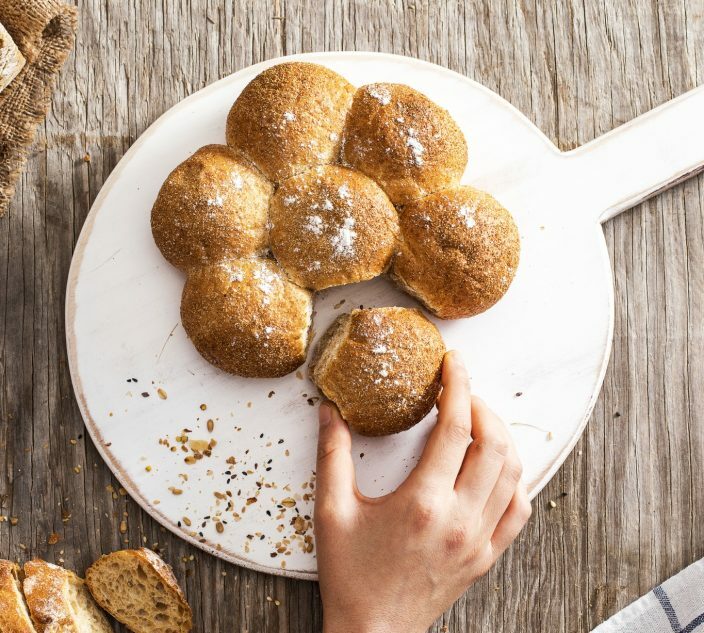 Once the diagnosis is made, patients go on the gluten-free diet and are prescribed dapsone, an oral medication that decreases inflammation and stops the growth of bacteria. Fasano says both treatments are typically needed to get DH under control. “The gluten-free diet is not really efficient enough to turn off the inflammation of the skin,” he says. The patient is gradually weaned off dapsone, and the gluten-free diet can keep DH symptoms in remission, according to Fasano. A review of the diagnosis and treatment of DH, published in the journal Clinical, Cosmetic and Investigational Dermatology in 2014, says dapsone is considered a valid option for patients with DH during the six-to-24-month period until the gluten-free diet is effective. Although dapsone is generally well-tolerated and can quickly relieve the most severe itching, complications from the drug, including lowering of normal red and white blood cell counts, can occur, so close monitoring is advised. Several alternative sulfa drugs are recommended if dapsone causes side effects, according to the review. Mcclymont is among those who react negatively to dapsone, which led to a week in the hospital soon after his diagnosis. Since then his DH has been treated with sulfasalazine and a strict gluten-free diet. He is occasionally exposed to gluten by accident and begins to feel an itch, but the virulent rash has not returned. Although the diarrhea, bloating, pain and other stomach symptoms associated with celiac disease do affect some people with DH, including Mcclymont, many say the itching is the worst part, followed by the visibility of the rash and the scarring. Suzanne Beach, 55, of Bellefontaine, Ohio, had stomach problems before she was diagnosed with celiac disease and DH. Sometimes these were so severe she would end up in pain on the bathroom floor. She lost 26 pounds and was hospitalized before doctors figured out what was wrong. But still, what really upset her was the bilateral rash typical of DH on her knees and elbows. “Number one, it’s really itchy, way beyond having poison ivy,” Beach says. She’s grateful that she has only had two instances of the rash since being diagnosed. “Number two, I’m out in the community a lot and having the visible rash would drive me crazy,” she says. Tania Fleming, 50, of Springfield, Pennsylvania, developed the rash nine years ago. Then, while taking a long road trip vacation, the itching became unbearable. “It was extremely uncomfortable. 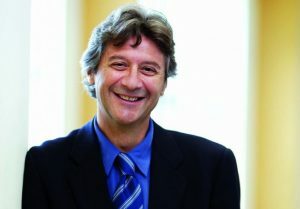 Dr. Alessio Fasano, leading celiac disease expert. “That’s what sent me over the edge,” she says. It also led to her celiac disease diagnosis, the gluten-free diet and the end of long-running intestinal symptoms. 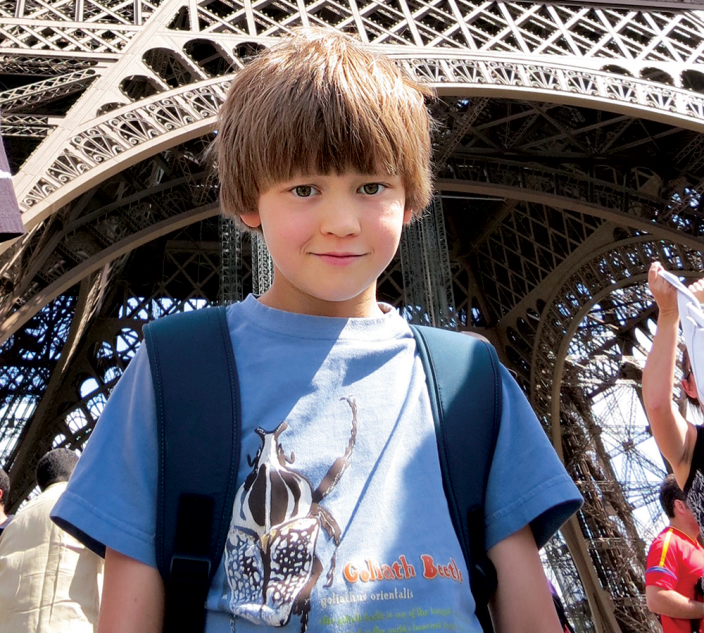 “The gluten-free diet changed my life,” says Fleming. Cathy Stevenson, 60, of Saint Lawrence, Pennsylvania, sums up her symptoms prior to the gluten-free diet this way: “It itches insanely.” Her description is no exaggeration. In fact, originally the rash was thought to be a psychiatric condition because of an association with suicide. “When we did not know what was going on, the majority of people with DH attempted suicide because nothing gave them relief,” Fasano explains. Much more about the disease is understood today, but questions remain. Although the immunological connection has been established, experts still don’t know what causes it to be triggered. “Why do people go for so long eating gluten with no problems and then all of a sudden develop DH?” Fasano asks. The same question is being asked about celiac disease overall, but Fasano says it applies even more to DH because the condition is rare in children and most often affects people in their 40s or older. Researchers are focusing on the composition of bacteria in the gut microbiome, which Fasano says can turn off or wake up the genes that put patients at risk for DH. Indeed, it’s hard to find continuing research specifically on DH. The U.S. National Institutes of Health database of clinical studies of human participants conducted around the world lists only three DH studies compared to 198 studies of celiac disease. One reason is that DH is relatively rare, affecting only about one out of every 10 people who have celiac disease, Fasano says, One 1987 study done in Utah found the prevalence of DH to be about 11 cases per 100,000 people. Hsu, who was diagnosed with DH in her 40s when she finally developed the classic itchy blisters after 10 years of occasionally getting a single non-itchy blister on her nose, says she diagnoses a new case of DH only about every three to five years in a busy practice. 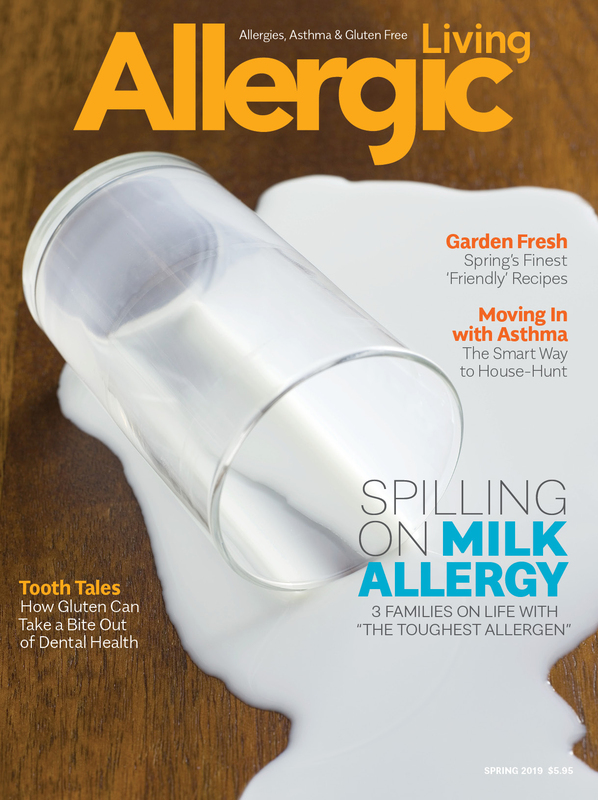 “A lot of people with celiac disease who get a skin eruption automatically think it’s DH, but that’s not often the case,” she says. Some of Hsu’s DH patients would like to take dapsone as a long-term treatment because they don’t want to follow the gluten-free diet. The danger, aside from side effects, is that dapsone only helps with the skin condition, not damage to the intestine and the consequent risk of lymphoma, she says. When DH symptoms persist, Hsu always looks at compliance with the diet. “Some patients say, ‘I still break out occasionally, so I just gave up,’” she notes. 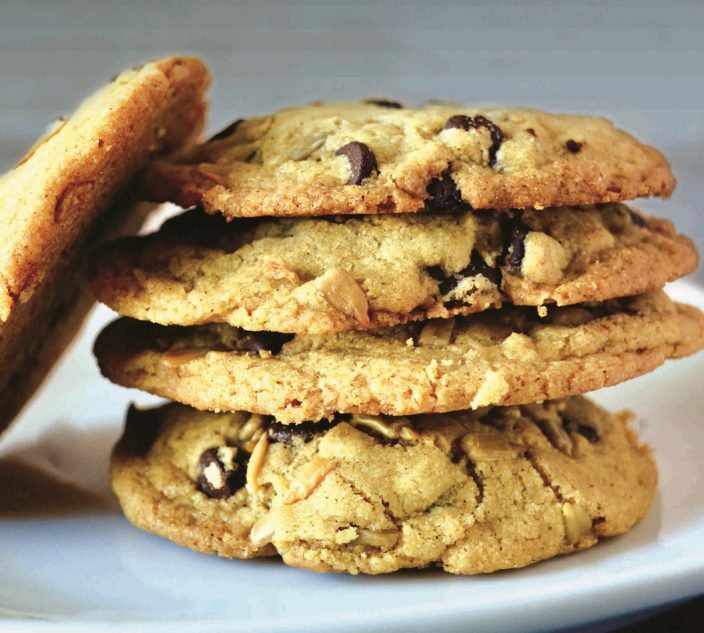 Others think they are following the diet, but are consuming gluten without realizing it. After diagnosis, it can take months of a gluten-free diet for the inflammatory response of the skin to clear, which can cause frustration. Yet Fasano says compliance with the diet is much higher among DH patients compared to others who have celiac disease, particularly those who have less severe or no gastrointestinal symptoms.